Earlier this month John and I went on a MISSION POSSIBLE Tour. 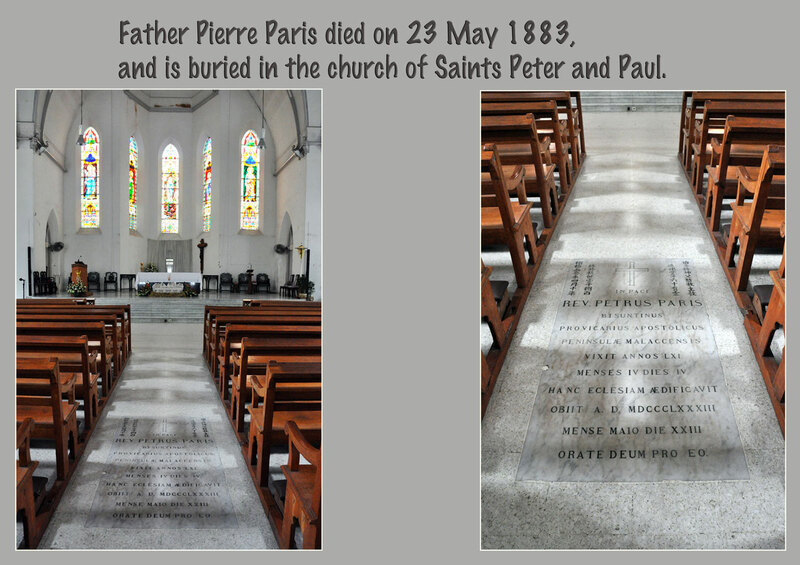 It was advertised as "Get an historical and personal insight into how inspiration, faith, grit and destiny combined to make the seemingly insurmountable task of establishing Catholic churches in 19th century Singapore possible". The Preservation of Monuments Board run many walking tours throughout the year and any one of them is worth attending. Our tour guide was excellent and was very helpful at all times. The previous blog post was on the Cathedral of the Good Shepherd. 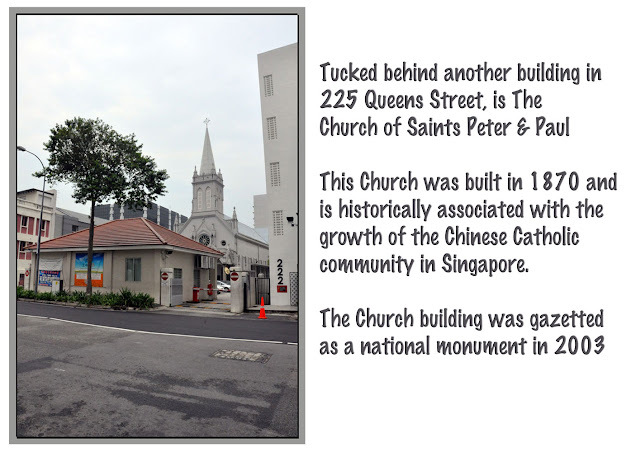 The history of the Church of Saints Peter and Paul is closely linked with the beginning and growth of the Chinese Catholic community in Singapore. The church, with its tower, was constructed between 1869 to 1870. It was erected by the Chinese Catholic Mission serving a congregation of all the Chinese dialect groups and their Indian brethren. It was also a centre for many European missionaries who needed to learn the Chinese language before other postings. 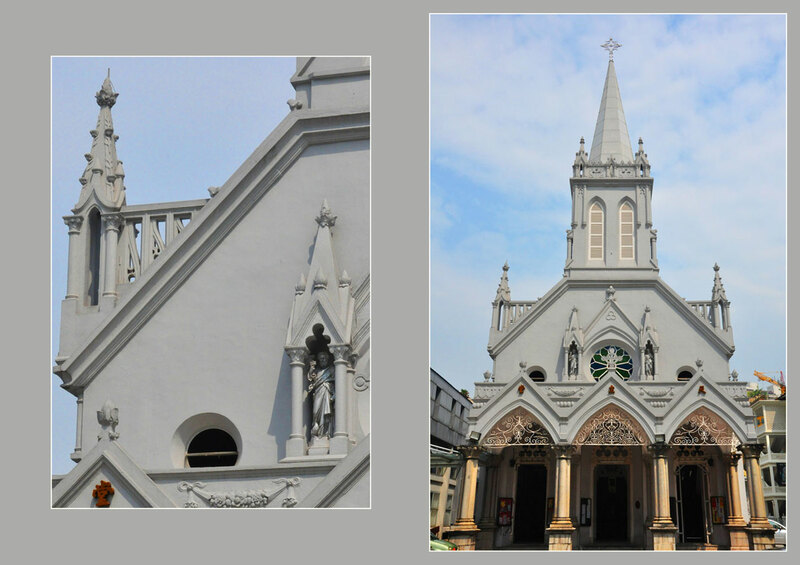 Initially, the Chinese Catholic community had contributed to the building of the first permanent Roman Catholic house of worship along Bras Basah Road. With a fifth of the construction cost borne by them, the chapel was ready by 1833. However, by the end of the 1830s, the chapel had become too small. Instead of enlarging the chapel, work was begun on the Cathedral of the Good Shepherd nearby and Saint Joseph's Institution took over the chapel's premises. Currently, the church is under the care of the Discalced Carmelite Friars. All masses are usually in English with a Mandarin service on Sunday mornings. 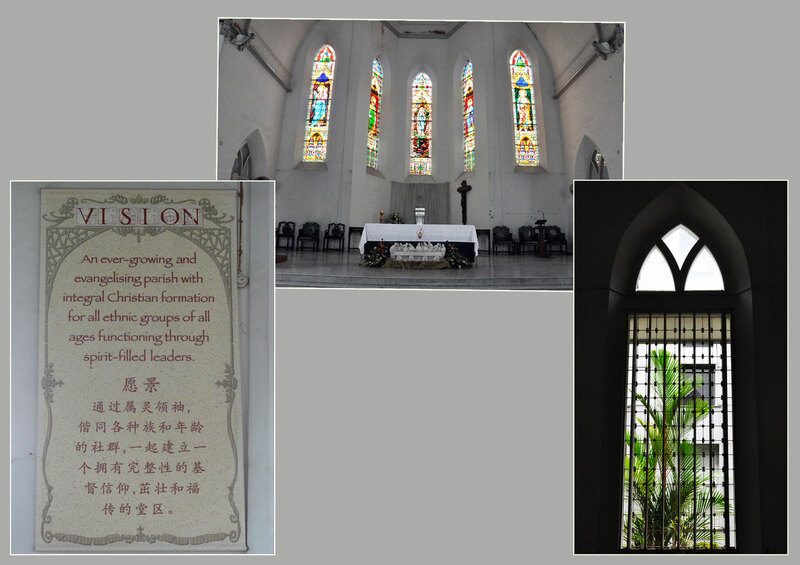 The first Catholic chapel in Singapore was set up in 1832 on the future site of St. Joseph’s Institution, and was home to the French Catholic Mission, which included a Chinese Mission. 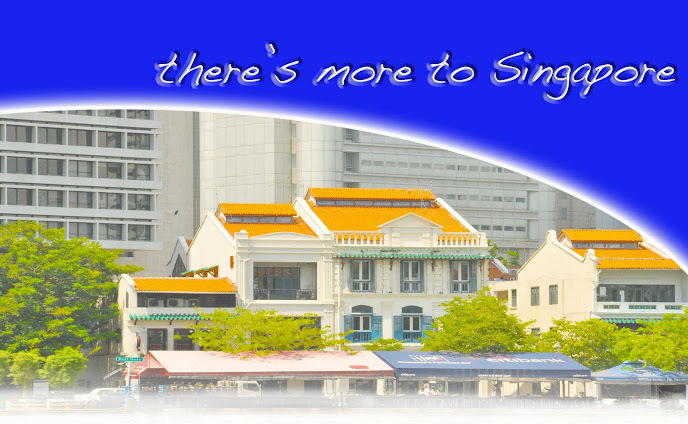 During this period, there were some 200 Chinese Catholics in Singapore. The first Catholic church, the Church of the Good Shepherd, was completed in 1846. The old chapel was converted into a parish school and Chinese missionary activities continued to be based there. Owing to the expansion of the Catholic congregation at the Good Shepherd, a new church for Chinese and Indian Catholics was constructed in 1870 in Queen Street. This was the Church of St. Peter and St. Paul. 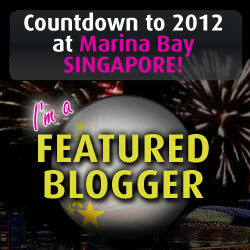 More information on this monument can be found in Singapore Infopedia, National Library Board.